The Massey University Executive MBA (EMBA) is a rigorous, challenging professional development qualification. Gain the relevant leadership expertise you need to progress your career. When you join Massey University’s Executive Master of Business Administration (EMBA) programme, you’ll become part of an internationally accredited business school and a demanding and comprehensive programme at a world-class level. As a busy executive, we know you have limited time. We teach at multiple locations around New Zealand. We are the only EMBA provider with convenient weekend teaching. This ‘weekend MBA’ gives you flexibility, allowing you to structure learning around your life, both professional and personal. The classes are specifically and solely for EMBA students, meaning learning is focused and relevant. This allows you to develop networks with relevant peers in your small group, who have common learning and career objectives. The Massey Executive MBA programme is the longest continuously-running MBA programme in New Zealand (running since 1972) and has accumulated an extensive and illustrious network. Our challenging and rigorous courses will help develop your critical and reflective skills, and enhance your business performance. You’ll emerge with a new confidence in your business practice and leadership skills and the ability to advance your career. Unlike other business masterates that focus on a particular business discipline, the Massey Executive MBA will provide you with a broad foundation in applying the various business functions - accounting, finance, management, and marketing - to develop business strategies. You are taught by selected academics, who are chosen for their ability to span the academic-practitioner divide. The latest research and business theory is shared with you through the international and New Zealand senior management experience of our lecturers. The Massey EMBA is a demanding programme where you will gain relevant in-depth knowledge of business administration today. A key part of the EMBA is developing a deeper understanding of leadership and it’s function in business. In parallel with the academic programme, every part of your study will help you develop the skills necessary for enhancing business performance through effective management of people - the only real sustainable source of competitive advantage. You will develop the skills, knowledge, and competencies required to have an immediate impact on your personal performance in the workplace, while you are studying. An international study tour is a unique highlight of the Massey Executive MBA. It is an opportunity for you to live and study together with your group, in an environment where you are away from the routines and pressures of work and home. The group visits large and small companies, focusing on learning from their strategic management and how companies overcame their challenges, both locally and globally. The Massey Business School is one of the country’s leading and largest business schools - it is ranked among the top two per cent of business schools globally and is AACSB accredited..
To find out more register your interest here. Massey offers three different options for those who wish to study towards an MBA. For students with significant work and management experience (7+ years full-time, with three of those in management). It is for those currently working full-time and involves regular weekend sessions. Teaching is face-to-face, located in Auckland. Suitable for domestic students. For students with 3+ years full-time work experience. One year of face-to-face sessions which take place on a Tuesday-Thursday in Auckland. Suitable for international and domestic students. For students with 3+ years full-time work experience. This is a fully-online programme, which involves intense small-group and one-on-one interaction with tutors, mentors and students. Suitable for international and domestic students. 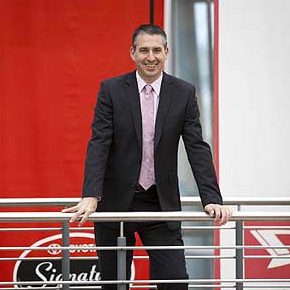 As Corporate Manager, Mark Young is in charge of planning, pricing, information services and environment at Toyota NZ. After over a decade with Toyota and having worked his way up through the ranks of the company, Mark felt it was time for an external perspective so he decided to apply for a Massey Executive MBA. Although he doesn’t consider himself naturally bright, Mark was determined to get the most out of the course and worked as hard as could on every course and assignment. The final result of a distinction with ten A+ grades, is evidence of all his hard work. The business models and theories Mark learned about on the course inspired him to make changes within Toyota. “I had the confidence to apply these models to the way Toyota approached projects. The results were dramatic and we do things quite differently now. It was great to see some tangible benefits to the company as a direct result of doing my MBA."